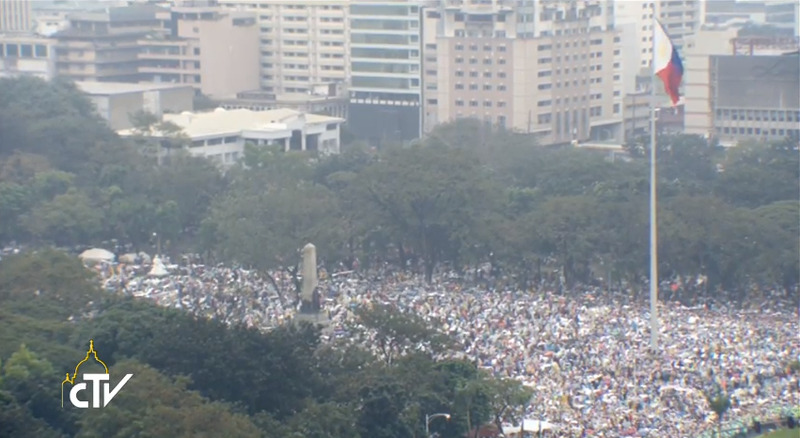 MANILA, Philippines - Pope Francis has arrived at Quirino Grandstand in Rizal (Luneta) Park for a culminating holy mass themed "Mass of Mercy and Compassion" at 3:30pm on Sunday, January 18, 2015, that is expected to attract around six million worshipers from around the country. Pope Francis which arrived at the park at 2:39 pm was welcomed by a Sinulog dance as he goes around the area to meet the crowd. 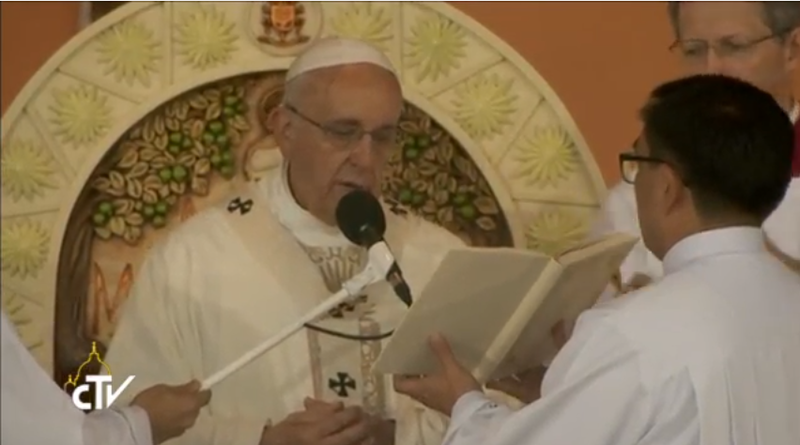 Reports said that the Mass will be in English and Filipino. The Prayers for the Faithful will be in Hiligaynon, Kapampangan, Ilokano, Cebuano, Waray and Bicolano, with English translations, which will be printed in an eight-page missalette to be distributed at the venue before the Mass begins. Malacañang Palace eyes for the historic papal visit this year to draw bigger than the record five million that turned out for Pope John Paul II’s mass in the same venue during the World Youth Day celebration on Jan. 15, 1995. Rizal Park covers an area of 6 million square feet or 560,000 square meters, which would mean one person per square foot. The Philippine National Police has deployed a total of 20,000 policemen stationed around Rizal Park to ensure the public's safety. The land facing Quirino Grandstand is on limited slot, roughly 2 hectares, and will definitely not be able to accommodate more than six million people safely. Area security will only roughly 700,000 to enter. To encourage people to come to Rizal Park and participate in the holy mass, Manila Archbishop Luis Antonio Cardinal Tagle issued a circular canceling all afternoon masses scheduled today in Catholic churches under the Archdiocese of Manila. Earlier, Interior and Local Government Secretary Manuel Roxas II advised that gates of the park shall be closed at 1:30 p.m. There will be “express lanes” for people without bags, Roxas added. On Sunday morning, the Pope met the religious leaders and young people at the Pontifical University of Santo Tomas in Manila.